What was the triggering moment when you realised your passion for Karate? I was 8 years old when I started practising karate in 2006. When I was in school, other students used to bully me because of my lean body. I told my father about that after which he decided to enrol me to learn karate and self-defense. 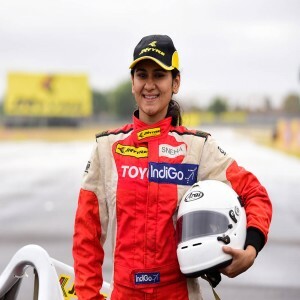 Thus, I started training under the tutelage of one of my father’s friend and steadily took an interest in the sport. How tough is it to manage your personal life with your sport? See it’s not like that you have to give up one thing to pursue another. Education is crucial at its place, and if your time management is good, you can balance things. I have a set schedule to give time to each task. I practice four days a week. Every day I practice for two hours in the morning and in the evening. On Sundays and Mondays, there are two batches in the morning and two in the evening in which I train students. That’s how I manage my week. During my college days, I opened my karate club at my college and used to teach students who want to learn. Now, the club is managed by my seniors. Over 200 students learn karate there. At present, I am working as a mechanical engineer in SAIL in Assam, and I utilise my off days in training children. And that’s how it goes. How does martial art help women and children to be safe? In today’s world of eve-teasing and other heinous crimes, Karate helps to develop the skills to defense, especially to women and children. If they start learning Karate at an early age, they can learn a lot. Even six months of training is quite enough to knock down a person of ordinary health. In this way, they can protect themselves from being harassed and also rescue others’ life. 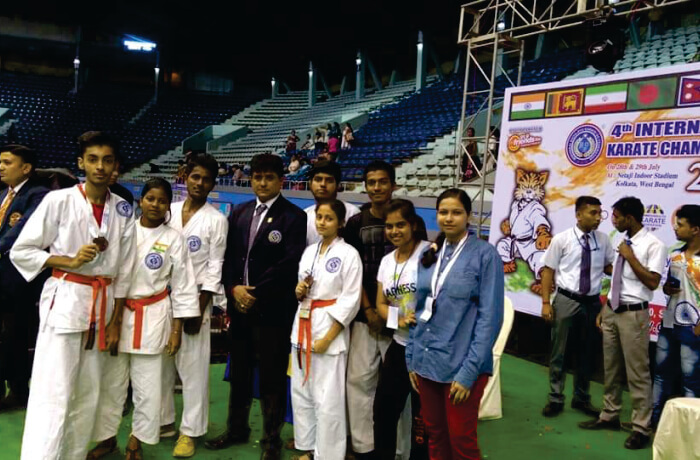 How tough was to win the International Open Karate Championship 2015? Total 8 countries participated in the championship. The most robust clash was with Iran. 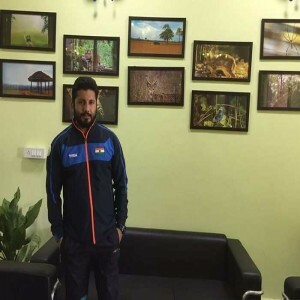 The thing is that Indian players somewhere lack in training and proper diet than international players, but our coaches supported us at their best, and hence, there was nothing to hustle in the event, and I succeeded in the end. Do you also promote other sports activities? 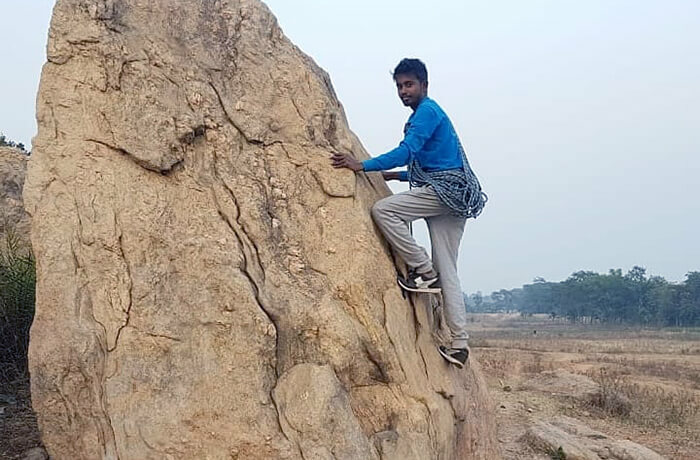 Yes, I also do adventure sports amongst which rock climbing and trekking are my favourites. What do you learn as a coach from your students daily? I am also a player as well as a coach and I even coach students of my age range. Teaching and managing them is a bit tricky as I have to take care of several things. Yes, I learn a lot from them like the way they perform various karate techniques with which I realised that I too need to polish my techniques. So learning is a never-ending process. You are learning even when you teach. What is your counselling and training strategy for players that are being recruited to play in national and international events? 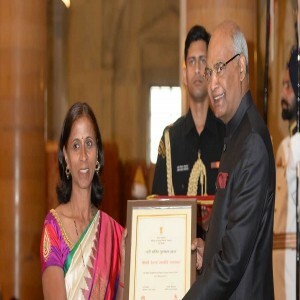 My coach is the referee commissioner and coach of the Indian national Karate team under whom I work to train students. To train practitioners, we assign them different schedules. Practitioners, who are preparing for the nationals and internationals, are trained according to a specific strategy based on stamina, speed, weight training, and fight that are scheduled for four days a week. Their diet and exercise schedules are different from those who want to learn Karate as the mode of self-defense. We train them twice in a week. So this is how it goes. 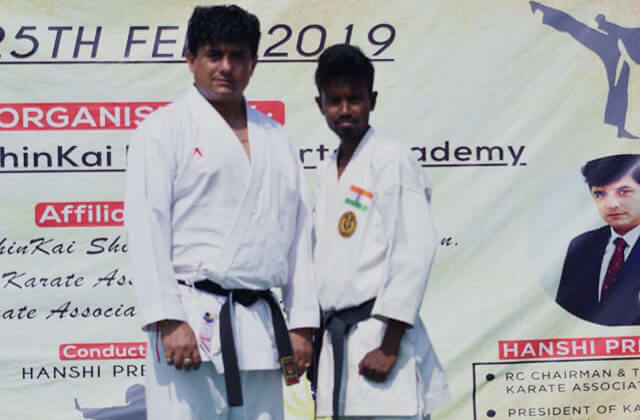 What Sayan Mondal would be if not a Karateka? If not karate, I would definitely go for rock climbing, hiking, trekking and other adventurous sports. As a Karateka, what is the primary quality one should have? There are 3 Ds - Discipline, Dedication and Determination. They are the three fundamental pillars to form your karate career. Besides this, patience is the key to develop the strength and empower your techniques to rule over your opponent and become an ideal karateka. Bruce Lee and Hanshi Premjit Sen. Both of them are my inspiration as Bruce Lee is famous for his techniques inspite of his lean physique just like me and Hanshi is the man behind my karate career because of whom I stand right here. So I look both of them as my role models. Define yourself in one word/phrase. 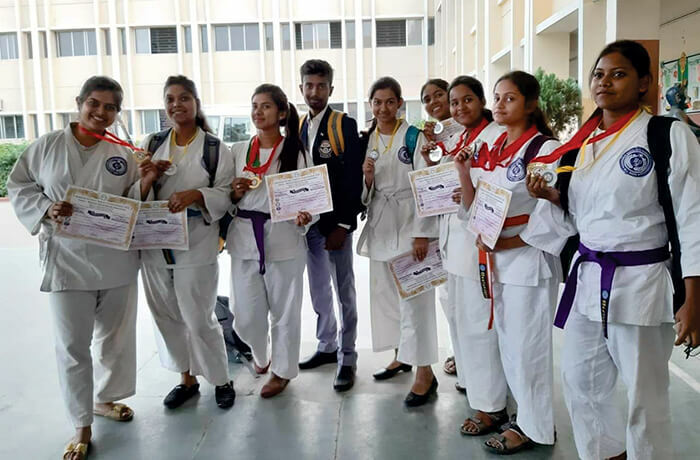 Your students have won medals at the 4th International Open Karate Championship 2018. How did it feel? Those moments are the proudest moments for me whenever my students bag medals at the prestigious sports stages. It feels really worth to be their coach, and ultimately your efforts are rewarded when they win. 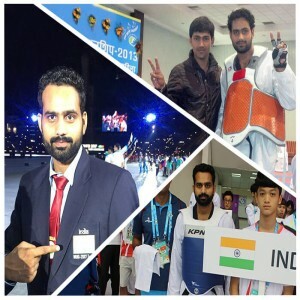 What is the role of media in a sportsperson’s life? Media plays a significant role to make or to break the career of an individual. But it all depends on the media’s response towards the achievements of a sportsperson. Like cricket is the sport which is covered the most by media platforms but no other sports like wrestling, boxing. If these sports also get the same level of attention by media platforms, people will eventually come to know about them and hence start taking interest in them. Why didn’t you go for cricket as the nation is freaking crazy about it? Yes, I too had an interest in cricket, but as I came to know about Karate, I found it more fascinating and indulge myself in the sport. The more I learned, the more I got biased and finally decided to pursue karate. You see, in every Government school of West Bengal, Karate is compulsory for girls from class 5 to class 9. 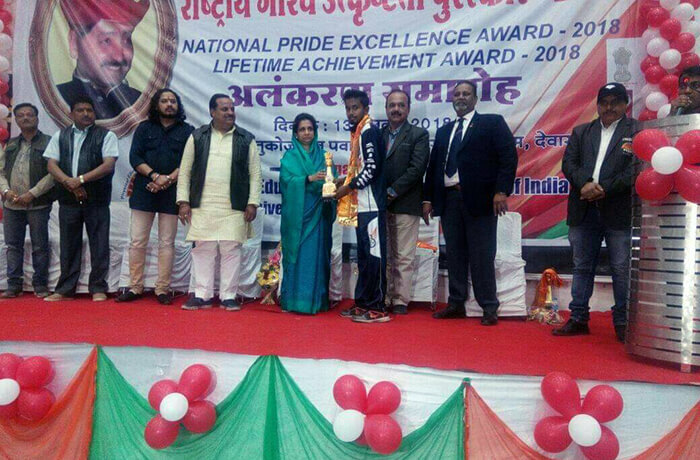 Now the way we promote karate, it seems that the sport is going to be crowd’s favourite as many of the international stages such as the 2020 Olympics have included the sport and Indian karate practitioners are also performing well in foreign countries. So I think the scene is going to be changed in the coming 10 years and we hope that Karate may have its own standard in the nation. 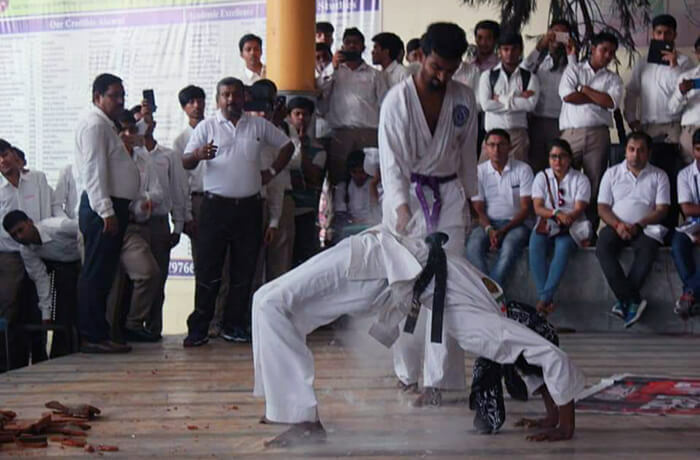 What are your thoughts regarding the efforts of the Government for the promotion of Karate in India? Although the Government of India is playing its role and many improvements have been seen since a decade but, I think it will be great if they encourage and support other sports also apart from cricket. You see, Kabaddi was not as popular as it is today. 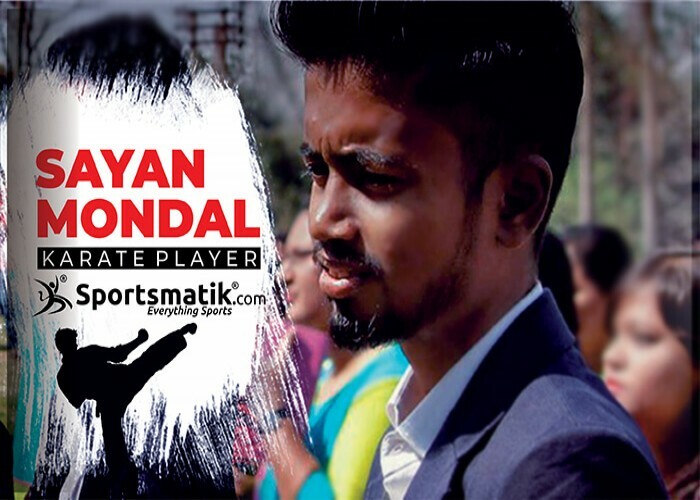 Media and the Government both have come up together to highlight the sport, and it was from then when Pro Kabaddi League is held in India and highlighted by the media platform, the sport gets its much deserving hype. So this is the thing what I want for other sports as well so that other sports may also get highlighted and athletes may not need to beg for sponsorships and fair chances to rise in sports. Which one is more difficult? Being a coach or a Karate practitioner? What I see on comparing the roles; coaching is a more difficult task because when you are a coach, you have a crucial responsibility to train the students to attain perfection. A practitioner has to perform, but a coach has to teach how to perform. So, he always has to be a level ahead of the mindset of the practitioner. When you get an ideal coach, then only you can learn the subject and its real standards. On the other side, if a coach fails to deliver proper training, a practitioner is not going to learn anything ever in life and portraying wrong techniques in front of them makes the scene worst. So coaching students to become a legend is a big responsibility which is tougher than being a student. What do you think about the initiative taken by Sportsmatik.com? It’s a wonderful platform with a great concept to highlight the efforts of players who deserve it. That’s really commendable. I have told my students to enrol themselves in your platform as it is worth for athletes like us. Wish you guys all the very best!